WEDNESDAY, Sept. 27, 2017 (HealthDay News) -- Using older red blood cells to give transfusions to critically ill patients doesn't appear to affect their risk of dying, Australian researchers report. 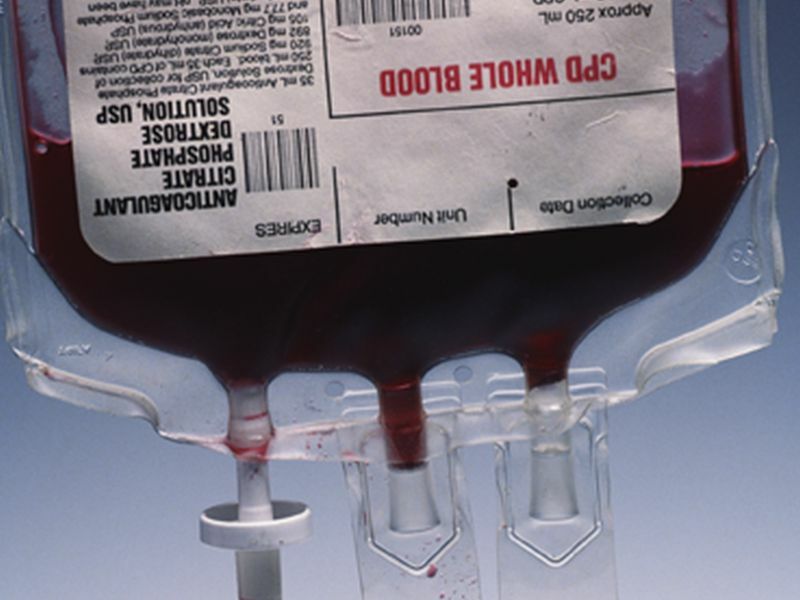 It was once believed that fresh red blood cells were best suited for transfusions. But this new study adds to the evidence that older blood is just as good, if not better, the study authors said. "Red blood cells for transfusion for critically ill patients are like a good red wine -- a little older, a little better," said researcher Dr. Jamie Cooper. He is professor and director of the Australian and New Zealand Intensive Care Research Center at Monash University in Melbourne. Study co-author Alistair Nichol added that a lot of inadequate research had suggested that fresher blood would be better to use in critically ill patients. Nichol is an associate professor of epidemiology and preventive medicine in the School of Public Health and Preventive Medicine at Monash University. The current practice is to use the oldest available blood, Nichol said. Red blood cells can be stored for up to 42 days, the researchers noted. "But due to concerns about the use of older blood, some blood banks had been reducing the age of the blood they transfuse," Nichol said. Reducing the age of blood for transfusions, however, may result in more blood shortages, he pointed out. "The current practice is safe and doctors no longer need to try and get the freshest available blood for their patients," Nichol said. He added that using newer blood to give transfusions to critically ill patients may be harmful. Cooper said, "We found two unexpected findings which support the use of older blood." Transfusion reactions were more common with fresher blood, and most seriously ill patients had better survival when they received older red blood cells, he explained. In addition, using older blood will make more blood available for transfusions, Cooper said. "Blood availability for transfusion will increase worldwide, because transfusion services will now avoid providing fresher blood for selected patient groups," he said. "Countries who have reduced their blood storage time from 42 to 35 days through concerns about blood age should consider moving back to the standard 42 days," Cooper suggested. From November 2012 through December 2016, the researchers randomly assigned nearly 5,000 critically ill patients to receive blood transfusions with either newer or older blood. The patients were from 59 medical centers in five countries -- Australia, Finland, Ireland, New Zealand and Saudi Arabia. Newer blood had been stored for an average of 11 days, while older blood was about 22 days old. Ninety days after the transfusion, 24.8 percent of patients who received newer blood died, while 24.1 percent of those who had received older blood died, the findings showed. After six months, the difference in deaths between those who received newer or older blood remained less than 1 percent. According to Dr. Edward Murphy, a professor of laboratory medicine at the University of California, San Francisco, "These findings are consistent with other recent studies." Stored blood deteriorates as it ages, and it was a concern that these changes in blood might harm patients, said Murphy, who was not involved with the new study. For example, as blood gets older, the red cells get stiffer and might release iron as hemoglobin leaks out of the cells. There was also concern that the fluid and the plastic bags used to store the red blood cells might affect the cells, Murphy said. "To my mind, the issue is settled that there is not a significant difference in outcomes related to how you store the blood cells," Murphy said. "It's reassuring that there is no difference." The report was published online Sept. 27 in the New England Journal of Medicine to coincide with the presentation of the study findings at the European Society of Intensive Care Medicine meeting in Vienna, Austria.